I’m going to let you in on a secret: quite possibly the most delicious olives you have ever tasted. I haven’t always been a fan of olives. My parents have never really liked them, so it was one of those things we didn’t have in the house growing up. But my olive-loving friends converted me, and now I’ll eat them by the handful. These are some fancy-looking olives, but they are SO easy to make. They’re perfect for a cocktail party, and I’ve made them for my best friend’s bridal AND baby shower, since she loved them so much. I’ll make them for myself as well, and keep them in the fridge to snack on. They are a Tyler Florence recipe — yet more evidence why I love that man. Why are they so good? I think it’s the magic of slow roasting, which infuses the olives wtih the citrus flavor of the orange, the earthy thyme and a hit of spice from the red pepper, and makes them juicy and a little softer than normal. The sherry vinegar gives them the perfect acidic kick. 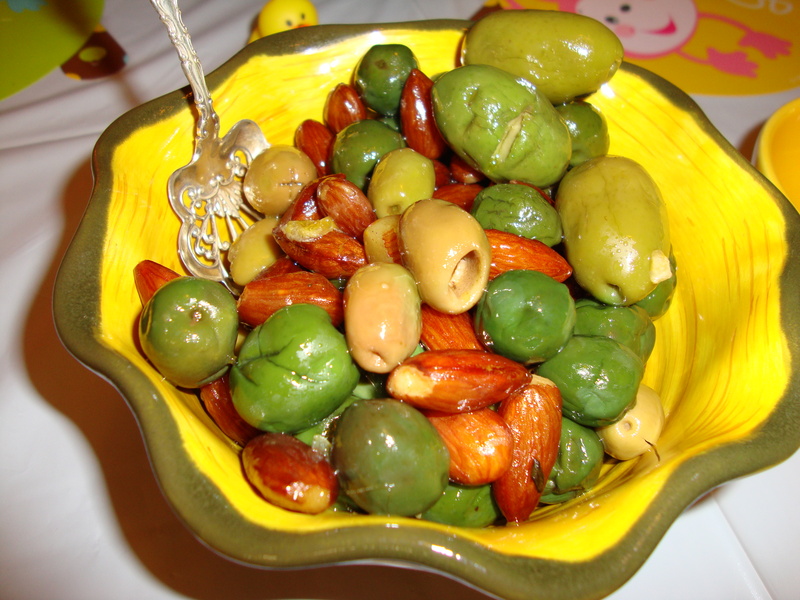 The almonds are delicious, infused with olivey citrus flavor, and a great contrast to the olives themselves. The recipe calls for mixing everything in a bowl, then pouring it into a baking dish. I just throw everything in the baking dish to begin with and mix it up. No extra dirty dishes! I’ve had a hard time finding the specific types of olives that are called for in the recipe — but I’ve had great results just picking some of the green olives from the Whole Foods olive bar. Pick ones with pits, and not the ones that are stuffed with almonds or garlic or marinating in something weird that will throw off the flavors. I take out the bay leaves and thyme stems before serving, as well as most of the oranges. But I leave a few because they give it some color. These are best straight out of the oven. But they’re great either way. If you’re taking them out of the fridge, let them warm up to room temp before serving. Preheat the oven to 300°F. Combine the olives and the remaining ingredients in a mixing bowl. Transfer the mixture to a baking dish, cover with foil, and bake for 2 hours. Drain the oil out (keep it to use as a bread dip) and serve warm or at room temperature with assorted cheeses. 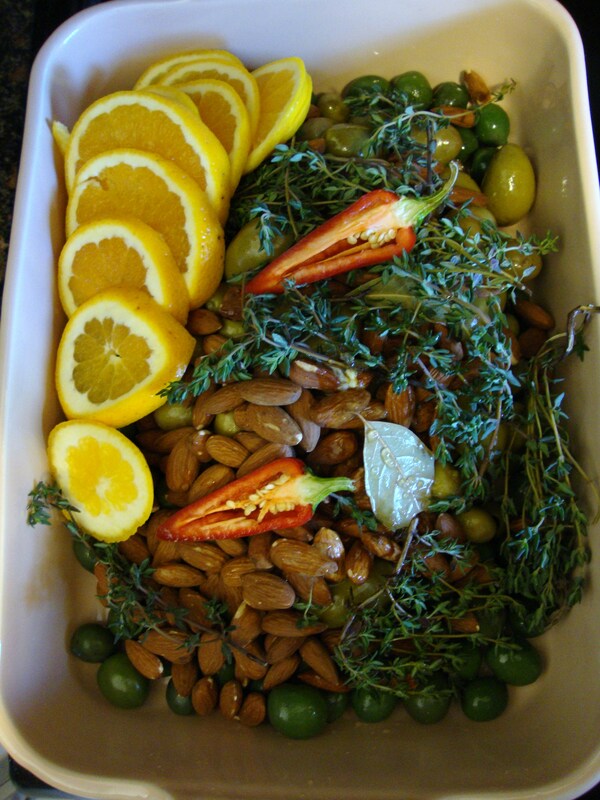 This entry was posted in Recipes, Uncategorized and tagged almonds, appetizer, cocktail party, olives by Tricia. Bookmark the permalink. 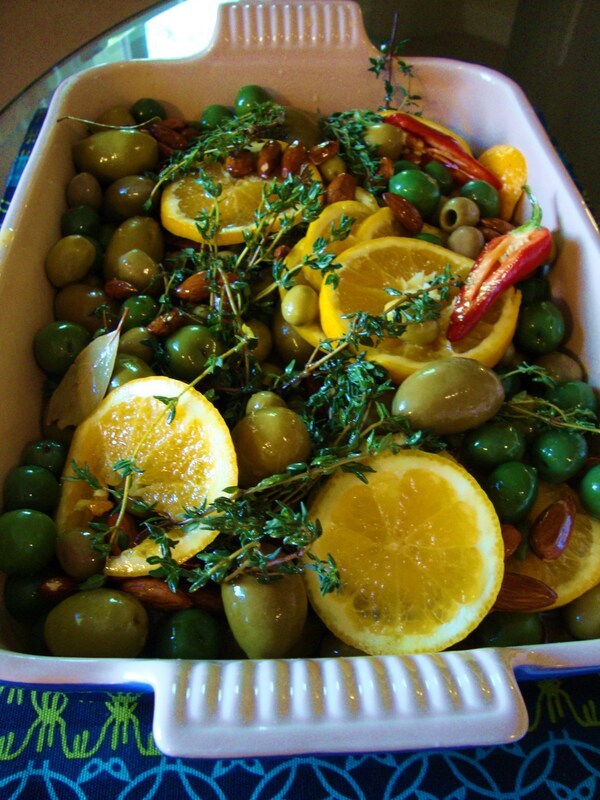 I don’t think I’ve ever heard of roasting olives, but they look delicious and would really dress up a party! Thanks Alyssa! I hadn’t either, but after tasting them, I was a believer!